International Boxing Federation (IBF) middleweight champion Sam Soliman (44-12, 18 KOs) physically fell apart and he looked every bit of his 40 years in losing to 36-year-old Jermain Taylor (44-12, 18 KOs) by a 12 round unanimous decision at the Beau Rivage Resort & Casino, in Biloxi, Mississippi, USA. Neither fighter looked good at all. Taylor may have won the fight, but he looked poor in comparison to the likes of Gennady Golovkin and Miguel Cotto, two of the best middleweights in the division. Soliman slipped on the wet canvas in the 7th, causing him to injure his left leg while being knocked down. Soliman was forced to limp for the remainder of the fight due to the injury, and he ended up getting knocked down 4 times in the fight. Taylor likely would have scored zero knockdowns if not for the leg injury that Soliman suffered. The final scores were 116-111, 115-109, and 116-109. Soliman was dropped in the 7th, 8th, 9th, and 11th. His left leg barely could keep him on his feet so it wasn’t surprising that he kept hitting the deck when hit solid by Taylor. Soliman was knocked down twice with jabs and twice with right hands. 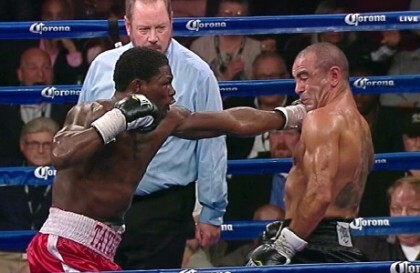 The obvious choices for Taylor’s next fight are Peter Quillin or Hassan Ndam Njkam. Haymon advises/manages Quillin, so there’s a good chance that we’ll see N’Dam getting passed up for a Quillin vs. Taylor fight. But we’re talking about a title holder here in terms of Taylor, and not the main guy in the division. The main guy is Golovkin followed by Cotto with the rest of the guys being so far behind them that it’s hardly worth mentioning them. In a largely disappointing performance from super middleweight contender Andre Dirrell (23-1, 16 KOs), he struggled for three rounds against little known 2nd tier fighter Nick Brinson (16-3-2, 6 KOs) until hurting him with a right hand in the 4th and then finishing him off with a snowstorm of shots. The referee stopped the fight while Brinson was taking punishment in the corner. The official time of the stoppage was 2:12. The stoppage was a little premature because the referee never even gave Brinson a chance to survive the flurry that Dirrell threw, and there was a possibility that he might have been able to survive. Dirrell took a lot of big shots in the 2nd and 3rd round from Brinson, who looked like a middleweight without the size to compete with Dirrell. Dirrell ruined his own post-fight interview by spending the entire time thanking people and then not getting any time to actually speak about what direction he wanted to go in for his next fight. The only thing he said is he wants to fight in December. Other than that, Dirrell spent the rest of the thanking people. ESPN2 finally cut Dirrell off when it was clear that he wasn’t going to stop blabbing. At that point the interview ended. Previous boxing news: Gervonta “Tank” Davis Makes His Television Debut On ESPN2 Tonight!